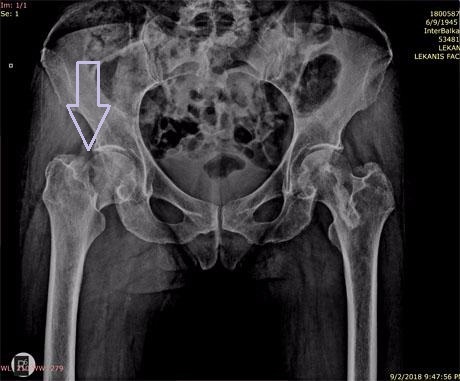 FEMORAL NECK FRACTURE | GEORGE D. GOUDELIS MD. Ph.D. 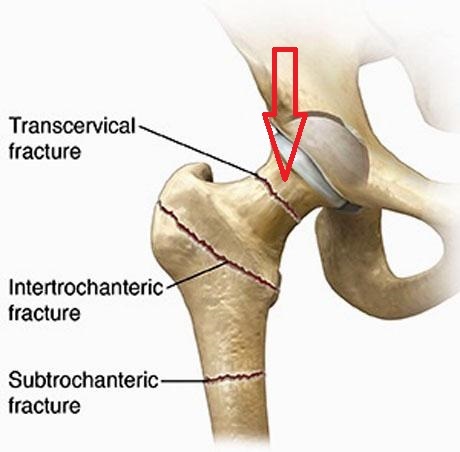 The fracture of the femoral neck (subcapital - transcervical) is considered to be an intra-articular fracture as opposed to the transtrochanteric considered extraarticular. The nature of the intra-articular fracture includes the blood supply of the femoral head, which is often disturbed as the blood vessels of the femoral head are injured. This is of particular clinical significance for the nature of the treatment of this fracture. 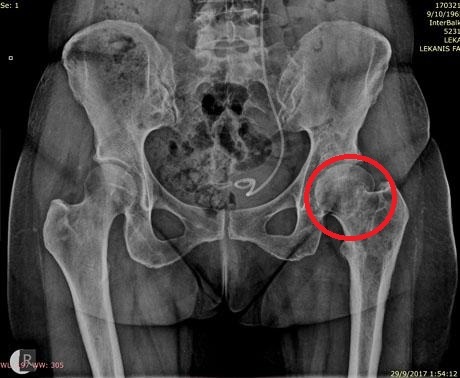 The subcapital fracture is one of the most common fractures that occur in the elderly people. This is due to the increased incidence of osteoporosis in these ages. Other contributing factors include reduced balance, muscle atrophy, reduced vision, neuromuscular disorders and, often, the disorders of saliva - malnutrition of the elderly. It usually occurs after a person falls on the ground without particular violence in the older ages. At younger ages it may happen but it takes more energy to cause it - high energy injuries. The patient should be transported directly to the orthopaedic emergency department with an ambulance where he will be subjected to clinical and radiological examinations to confirm the diagnosis. The treatment of the femoral neck fracture (hip joint), is mainly surgical. The goal of surgical treatment is to stabilize the fracture and the patient must be mobilized as fast as possible. 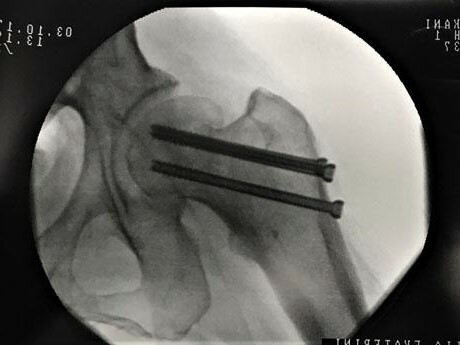 Today, modern Orthopedic surgery, with the development of a new surgical techniques as well as the modern design and quality of the titanium implants, can offer the patient the possibility of receiving a minimally invasive surgery - which means a small skin incision and separation of the tissues, without cutting the muscle groups, resulting in the patient getting up standing and walking even on the same day of the painless surgery, Fast Track method. 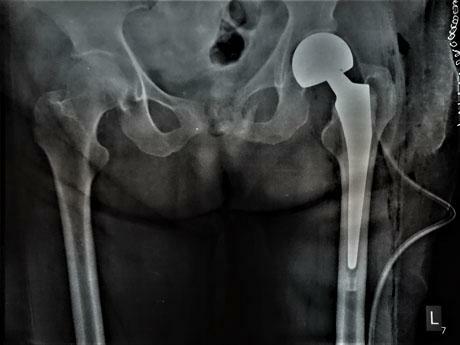 The pinning of the femoral head with special cannulated cancellous titanium screws is the surgical method of choice in young patients whose main aim is to maintain the femoral head rather than replace it. The surgery is performed by a small insicion of the skin with the aid of a x-ray machine. The duration of the surgery does not exceed 40 minutes and is usually done with general or dorsal anesthesia. For this reason, it is recommended to stabilize the fractures as soon as possible since they occur, as the general health of the patient permits. 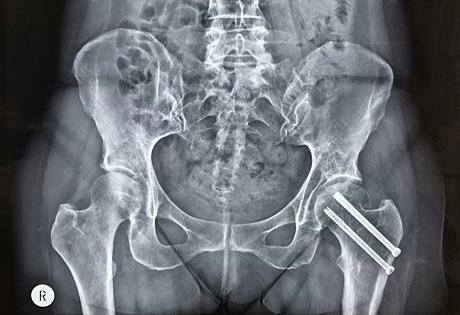 Hemiarthroplasty of the hip means that the replacement of the broken femoral head and not its fixation is performed. The method is indicated to a patient who has over the age of 80 and the great advantage of the method is the immediate weight bearing and walking on the same day of the surgery. Today the surgery is done with the ALMIS arthroplasty method, which belongs to the minimal invasiveness procedures. 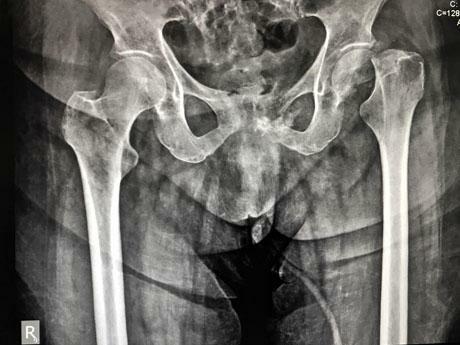 Subcapital displaced fracture of the left femur. Woman 81 years old. Total hip arthroplasty is the surgical method of choice for a patient between 65 and 80 years of age. The new method currently applied in large hip surgery centers in the world is performed with a small incision of the skin and separation of the hip muscle groups - a bloodless surgical path - reaching the affected joint and replacing it. It belongs to the minimally invasive surgeries, with a operative time is about 90 - 100 minutes and is done with general or dorsal anesthesia. 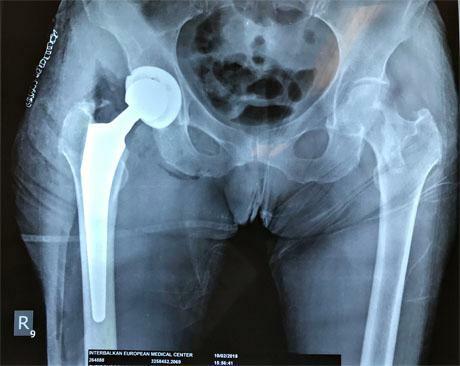 The great advantage of the ALMIS hip replacement is the rapid mobilization of the patient without pain in the operated joint, the weight bearing of the affected limb starts at the same day of the operation with assistive device for 10-15 days and after these days without it. The patient stay at hospital 2-3 days postop and depends on his general health condition. After that is not necessary to transfer the patient to a rehabilitation center. Self-handling is immediate without the patient having to be bedridden, thus reducing the chance of developing thromboembolic disease.